This is an amazing camera, it provides full HD 1080P resolution and has a motorised zoom (2.7-12mm) lens which means you can adjust the angle of view remotely to get up to 4 x zoom! This feature has many benefits - not only does it make installation a lot easier as you can adjust the angle of view remotely, instead of when you are up a ladder installing it. But it also allows you the flexibility of zooming cameras in & out at the touch of a button. 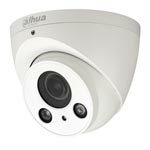 To complement this Zoom the HAC-HDBW2220R-Z also has built in IR night vision allowing you to see up to 30 metre's in complete darkness, but it is what we call "Smart IR" which means it adapts to how close objects are to the camera - allowing you to see good detail of closer objects instead of the "ghost look" that happens with many powerful IR cameras. 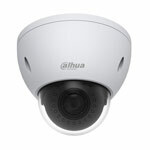 Last but not least the camera is also vandal proof (IK10) allowing even more flexibility with where you can install it. 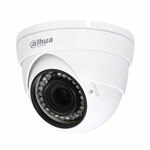 All in all one of the best value HD over Coax Cameras available. 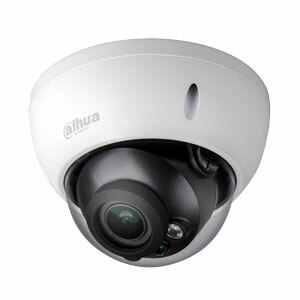 This is a 2-axis dome camera, meaning it is built for installation on a ceiling or on the eaves of your house. 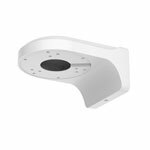 If you were to wall mount this camera it can only point directly forward - unless you use it with a wall bracket like the PFB200W. To make full use of the motorised zoom lens we strongly advise using with Dahua HD-CVI recorders only.